Over the weekend, the three of us drove up to St. Petersburg to visit our friends Scott and Diane, who we met while we were all living aboard our sailboats at El Milagro Marina in Isla Mujeres last summer. They sailed away from there about a month after we left and have been living on their boat at the Harborage Marina in St. Petersburg. With them now are Charlie and Karen, mutual friends from last summer in Isla Mujeres, who have sailed on from there to Roatan in Leap, their Pearson 386 sloop, but are taking a break from living aboard for an adventure of a different sort. The two couples have been preparing Ati, Scott and Diane's Amel Super Maramu 2000 ketch, for an extended trip down to Grenada. They're planning to leave by mid-May and work their way around the Keys, through the Bahamas, past the Dominican Republic and Puerto Rico, and then down through the Leeward and Windward Islands. Charlie and Karen are on a schedule and will depart in San Juan, Puerto Rico, but Scott and Diane will take their time enjoying the remaining trip to their final destination. The drive took longer than expected, and we arrived too late on Saturday afternoon to go sailing. We hung around the boat instead, catching up over beers and watching Scott and Diane's new labradoodle Yogi work out the pecking order with Scout. From there, we walked several blocks to a bar downtown with outdoor seating (so we could bring the dogs) and live music. I may be getting old but I can't tolerate music that is too loud to talk above, especially country and especially outdoors. We were ready to go after just one drink, off in Charlie and Karen's van full of tools, which they had put in storage in Alabama before they set sail last year and then driven down to use in preparation for the upcoming trip. We headed west to a dog-friendly, waterfront restaurant in nearby Gulfport called O'Maddy's. My crab cakes were pretty average, but everyone else enjoyed their seafood dishes. It was late when we arrived back at the marina, so Nan and I said our good-nights and navigated the difficult one-way streets of downtown St. Petersburg to our hotel on the north side of town. The next morning, we arrived back at the marina later than planned due to a citizen's bike race that had us detouring all over town. By the time we reached the boat, Scott already had the engine running and we prepared to cast off. Scout was a little nervous about being on a moving boat--it was only his second experience--and stuck close to Nan and me. 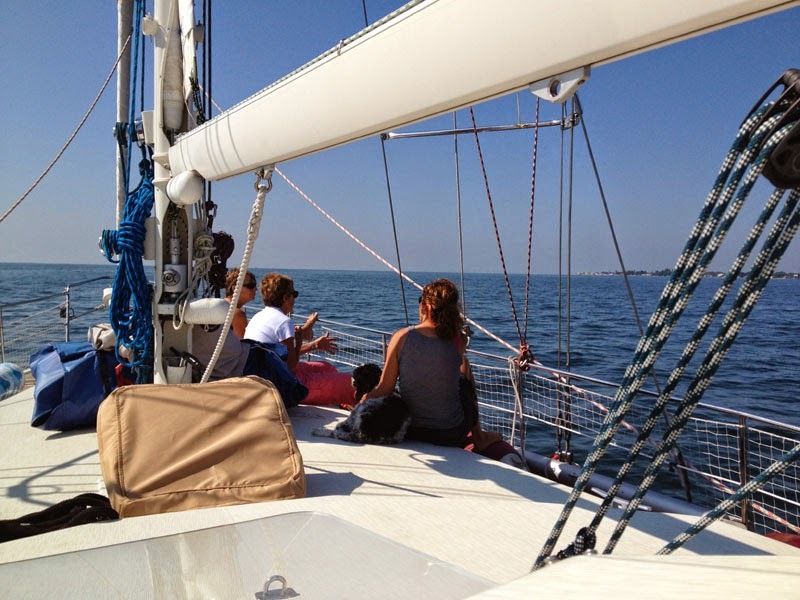 There was not much wind as we motored south in the lee of St. Petersburg's landmass. It picked up a little when we reached the open water of the bay, but it was right on our nose. Diane took advantage of the smooth conditions and made a lunch of grilled-cheese sandwiches for everybody. 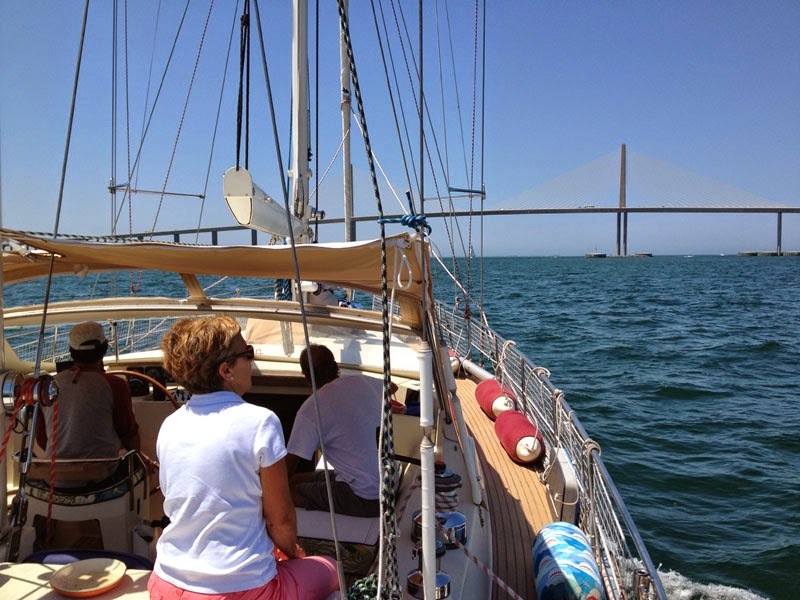 Scott planned to motor past the Sunshine Skyway Bridge for a ways and then put out the sails for the return trip. 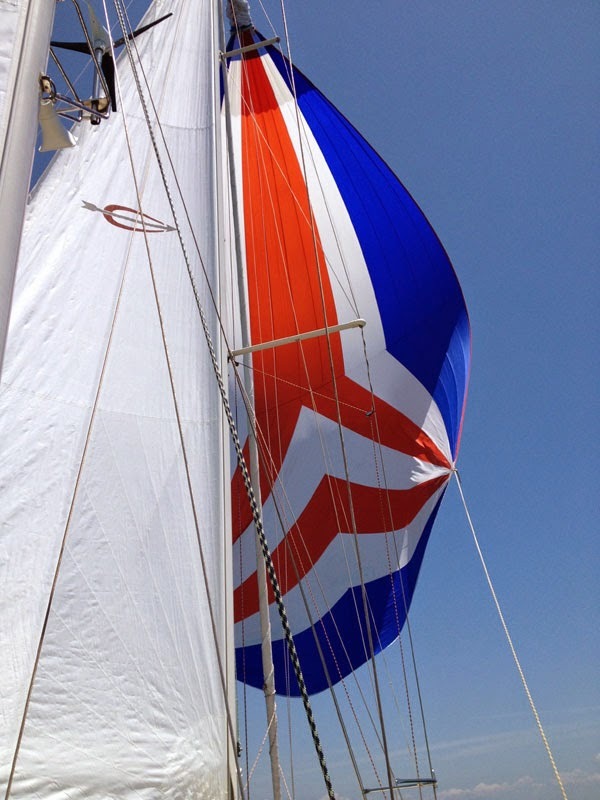 This worked well and we had some good light-wind sailing, perfect for testing out the spinnaker, which they plan to use on the big trip south. 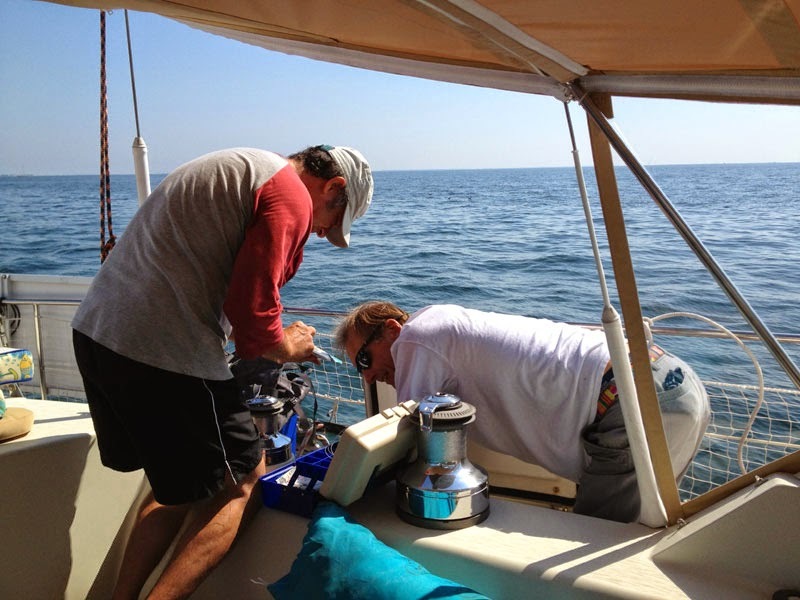 The current was running when we returned to the marina, making for a dicey slip re-entry, even with the bow thruster, but Scott got the boat parked safely with a little shore assist. 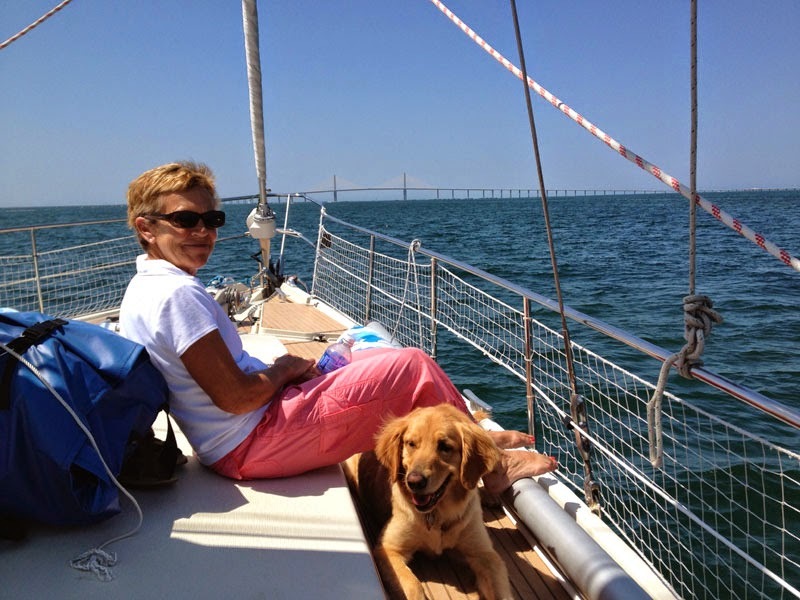 It was already mid-afternoon, and Nan, Scout and I still had the four-hour drive back to Miami ahead of this, so we said our good-byes, promised to stay in touch, and wondered aloud about when our future paths would cross on the open water. Best wishes for a safe and happy sailing adventure! Happy birthday, Scout! Our good boy is six years old today.